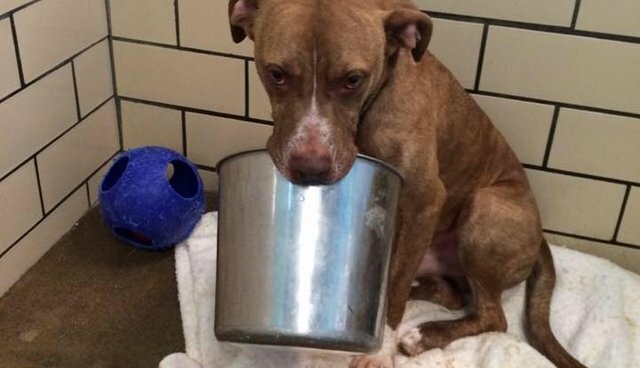 A sad, unloved shelter dog named Slim has found a heartbreakingly humble source of comfort during his long wait behind the bars of an animal shelter - a simple metal bucket that serves as his only friend. Slim was rescued last December after being found starving and scared inside an abandoned house. Since then, the 4-year-old pit bull mix has been held in a kennel at the Ashland County Dog Shelter in Ohio, eagerly awaiting someone to come by and adopt him. There, caretakers offered the energetic dog a variety of playthings with which to pass the time, though Slim prefers one above all others. "He is anxious in the shelter and has destroyed most of the toys he's been given. But his favorite toy is his Bucket!!!" writes the group Rescue Me Ohio on Facebook. "He loves his bucket and is lost without it!!" While Slim has apparently found some semblance of solace with that humble toy, what he needs most is a forever home with a family who loves him. To learn more about Slim, and to find out how you can help, contact msviatko@zoominternet.net.